yes... November 30th is my final day. I will be still designing from time to time and offering my goodies on my blog and advertising them on my Facebook Fan page. I'm looking forward to no deadlines, blogging about my bargain finds, Valley Fever info, and whatever else I feel like. *ETA - I'm not retiring only because of having Valley Fever. I've been thinking about it for a little while before this even happened. I am just ready for having the time to possibly scrap again, having no design deadlines, being able to start a new blog about misc bargains & information - including designs on there from time to time.,,,,, and just feeling like I have more freedom for whatever. 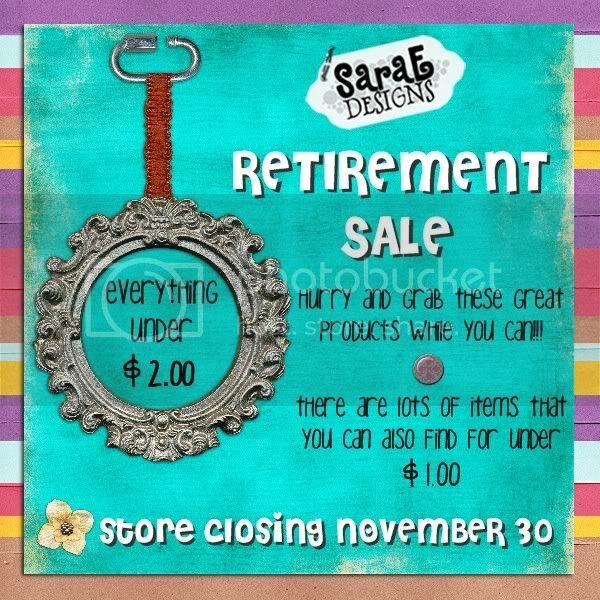 Thanks so much for supporting me at SDD, my previous stores, and in our digiscrap community. I truly appreciate it! Sara, I hope that you get to feeling better soon! I completely understand wanting to just be deadline-free and have time to focus on whatever you want to! Thanks for all your wonderful designs. I hope you get well soon. Good luck in all you do.